The Museu Nacional d'Art de Catalunya or MNAC in the Palau Nacional on Montjuïc hill houses a great collection of mostly Catalan art spanning from the early Middle Ages to the early 20th century. 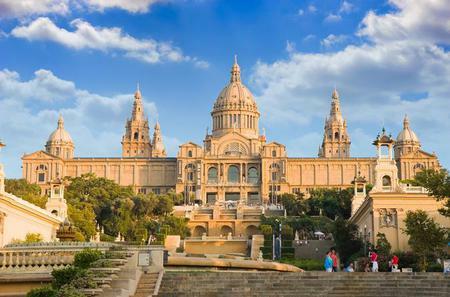 The Museu Nacional d'Art de Catalunya or MNAC in the Palau Nacional on Montjuïc hill houses a great collection of mostly Catalan art spanning from the early Middle Ages to the early 20th century. The ground floor displays the collections of Romanesque, Gothic, Renaissance, and Baroque art, while the first floor has the sections on Baroque and Modern art, and numismatics. 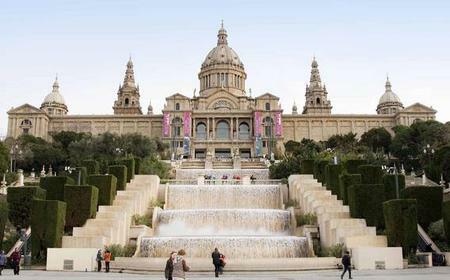 The MNAC has the single best collection of Romanesque art in the world, and a fine Gothic collection as well. The Romanesque Collection features a remarkable collection of murals which originally adorned rural churches in the Pyrenees and other sites in Old Catalonia. The interiors of several churches have been recreated and the frescoes are displayed in their original setting. The works on wood, stone, and metal are arranged chronologically and stylistically, mostly ranging from the 11th to 13th centuries. The piece-de-resistance is the image of Pantocrator or Christ in Majesty circa 1123, depicting Christ enthroned on a rainbow surrounded by the four Evangelists with the world at his feet, holding a book with the words Ego Sum Lux Mundi (I am the Light of the World). It was taken from the apse of the Sant Climent de Taüll, along with another image of the Virgin Mary with Child. Other works of note include murals from Sant Joan in Boí which reflect French Carolingian influence, works from Church of Sant Quirico de Pedret, Monastery of Santa Maria d'Àneu, Sant Pere de Seo de Urgel, San Pedro de Arlanza, and the chapter house of Sigena. The Gothic section display a chronologically and thematically arranged collection of works from the 13th to 15th centuries from territories that were part of the Kingdom of Aragon – Catalonia, Aragon, and Valencia, as well as Majorca. Works of note include Bartolomé Bermejo's 'Resurrection and Descent of Christ into Limbo', Jaume Cascalls' 'Head of Christ', Guerau Gener and Lluís Borrassà's Gothic altarpiece of Santes Creus, Jaume Huguet's 'The Consecration of Saint Augustine', the Altarpiece of Saint Vincent, mural paintings of the Conquest of Majorca, Gonçal Peris' Altarpiece of Saint Barbara, Juan Rexach's Altarpiece of Saint Ursula and the Eleven Thousand Virgins, and Pere Serra's 'Virgin of the Angels'. The Renaissance and Baroque collection features works not only from Catalonia, but also the rest of Spain along with Italy and Flanders. The Cambó Bequest and the Thyssen-Bornemisza Collection significantly enhanced the collection. Highlights include 2 tables by Bartolomé Bermejo , Ribera's 'Martyrdom of St. Bartholomew', Giambattista Pittoni's 'Virgin with Child and Saints', Francisco de Zurbarán's 'Immaculate Conception', Diego Velázquez's 'Saint Paul', Jacopo Tintoretto's 'Portrait of a Gentleman', Fra Angelico's 'Madonna of Humility', Francisco de Goya's 'Allegory of Love: Cupid and Psyche', and Peter Paul Rubens' 'Virgin and Child with St. Elizabeth and St. John'. The Modern Art collection spans from the Neoclassical, Romantic and Realist movements to Modernisme and Noucentisme. Highlights include Salvador Dalí's 'Portrait of My Father', Alfred Sisley's 'En Saint Mammès', Pablo Picasso's 'Woman with Hat and Fur Collar', Antoni Tàpies' 'Brown', Antoni Gaudí's 'Confidante of the Casa Batlló', Ramon Casas' 'Ramon Casas and Pere Romeu in a Tandem', Edvard Munch's 'Portrait of Thor Lütken', Mariano Fortuny's 'The Vicariate' and 'The Odalisque', and Santiago Rusiñol's 'Laboratory of the Galette'. Modernista furniture and decoration are also on display. The Cabinet of Drawings and Prints has over 50,000 drawings, 70,000 engravings and more than 1000 posters. The museum also houses a rich numismatic collection of over 130,000 items, including coins from the 6th century BC to the present, minting tools, coin weights, scales, jettons, pellofes, tokens, stamps, and medals. Entry tickets (€12) are valid for 2 days in the month from the purchase date, so you can admire the incredible collection at leisure. Admission is free for children under 16 years and senior citizens over 65 years. Discounts are available for students, families, and large groups.